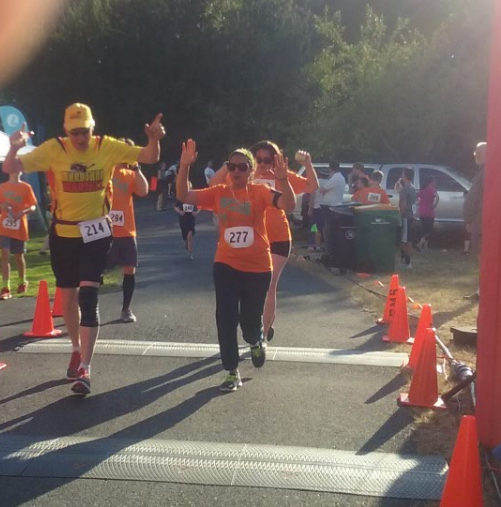 ← 2017 Washington Beer Run 5K: The slackers’ alternative? 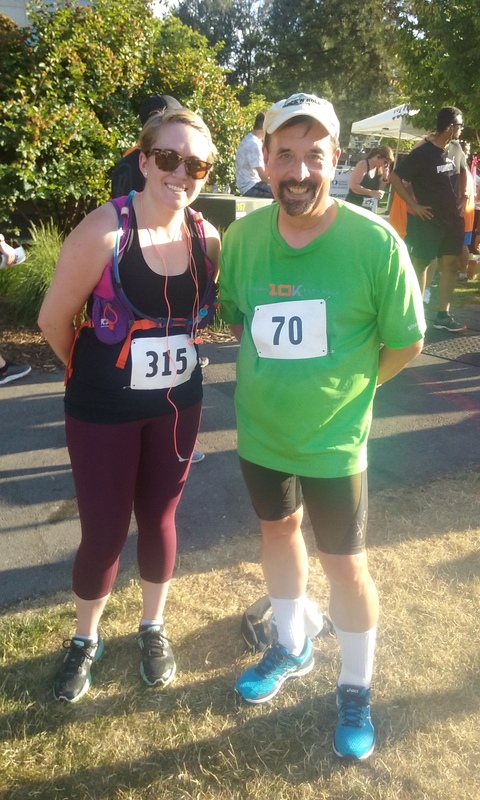 Friday night, July 7, offered two recreational options that appealed to me: The Cascade Bicycle Club’s Seattle Night Ride and the Redmond Derby Dash 5K run. I really want to do the Seattle Night Ride sometime, but the Derby Dash on the same night is hard to turn down. 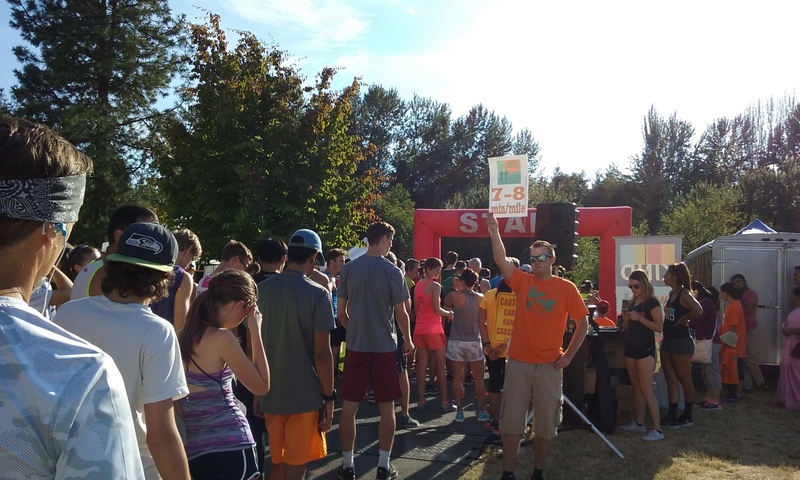 It is a flat, fast 5K run on the Sammamish River Trail, located about a mile from where I work in Redmond. And it’s a great way to end a challenging day and week of working directly with clients. Three Allytics teammates did the run with me in 2016, but this year, I could only talk one teammate to run with me (thanks, RJ!). We still had fun. This may be the fastest 5K I do this year — and, hopefully, not the last run of 2017, but more on that below. It is a good workout because you push yourself to get what should be your best time of the year. There’s no reason not to go all out in this event, even if it is hot and sunny out. You need to make it hurt getting through that last mile. Because it is a simple out and back with no hills and only one turnaround, this course is easy to navigate. RJ Ricker, the Allytics co-worker who ran it with me, got a 5K PR of 25:34 (8:15 per mile), for seventh in her age group and 17th among women overall. Congrats, RJ! 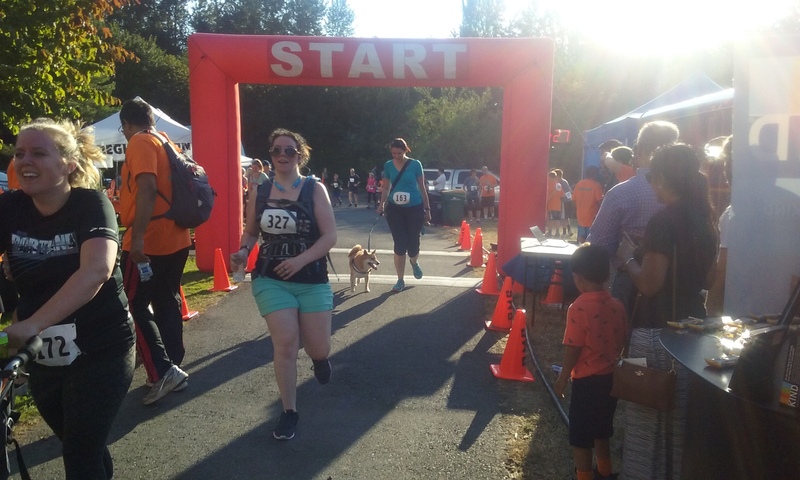 After suffering ankle pain off-and-on over the last month, and wondering if I could even run, period, I was happy to finish in 37:08 (11:59 per mile). It was slower than my 35:40 time for this run a year ago, but my ankle was in better shape then. Still, it was my fastest time since that race. Full 2017 results are here. By the way, my 5K PR is 24:32 (7:53 per mile) in 2005, when I was younger and injury-free. I will never run that fast again. Feels good to hit the finish line! 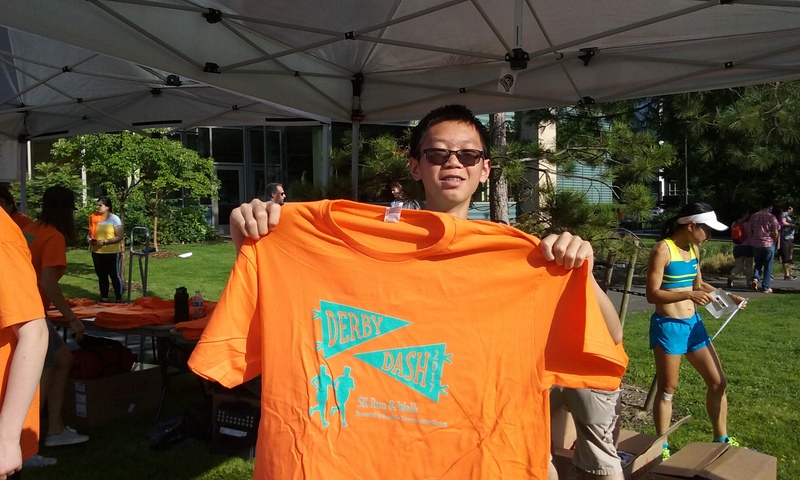 Some 327 runners and walkers completed the Derby Dash, a slight increase from a year ago. The Sammamish River Trail is narrow enough that it cannot accommodate many more participants, as there is a logjam at the start. But I noticed fewer problems with bicyclists and other non-participants interfering with runners than I wrote about a year ago. If you do this run next year, you’ll still have to watch out for bicyclists zipping past you in either direction. It’s just one of the hazards of running on the trail near the Microsoft campus, though not all of the cyclists are Microsofties. 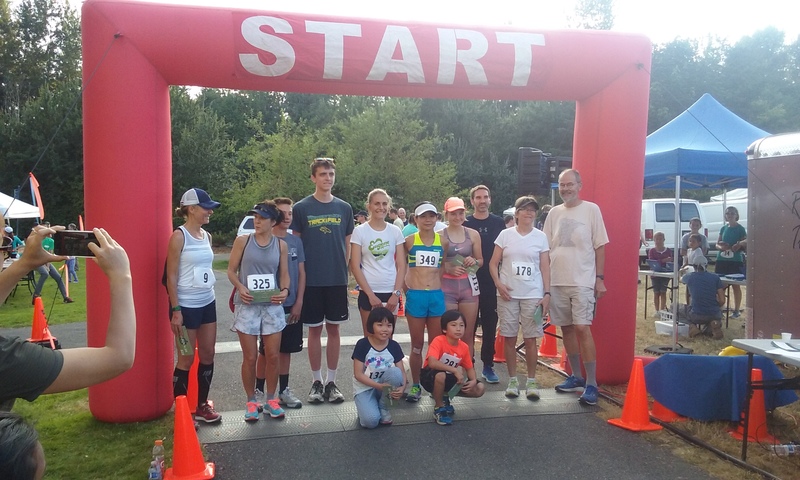 What I liked about the Derby Dash is that participants ranged in age from five to 72, and represented all levels — from first-place winner Devin Wulff (who runs for the University of Portland) in 15:54 to the final finisher from Calgary, Alberta, in 1:08:43. That kind of age and time range means I am likely to beat a few people. Among the runners was Sophia Liu, who won both the 2016 Rock ‘n’ Roll Seattle Marathon and the 2014 Seattle Marathon. She came in second among women in 18:12. The Derby Dash is part of Redmond Derby Days, a two-day community festival largely held on the Redmond City Hall campus where the run started and ended. 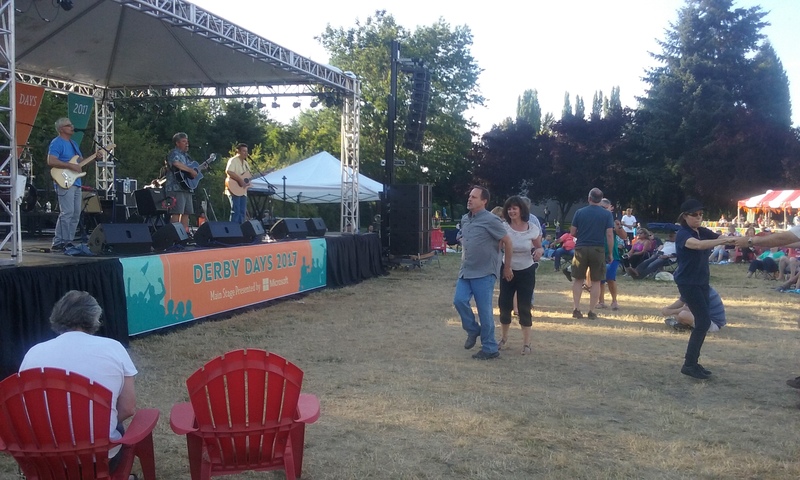 Nearby, beer and wine were poured at a beer garden, and a classic rock band, Ventura Highway Revisited, played from a big stage for a few hundred people danced and listened. I have another July run I plan to do — the Seafair Torchlight 8K Run on July 29. This downtown Seattle event went on hiatus last year and I worried that it wouldn’t come back. I’ve run it 11 times, from 2003 to 2010 and again from 2013 to 2015, and still consider it a must-do event each year. But I’m not signing up for any others, for now, and plan to meet with my ankle surgeon soon to see if another surgery is needed. He told me in 2011 that I might need another one in five years, and it’s been six. Running and bicycling are important to me, so I very much hope to continue both. That’s my story. Thanks for reading! This entry was posted in 5K, 8K, Bicycling, Rock 'n Roll Seattle Marathon, Running, Sammamish River Trail, Seattle Marathon, Walking and tagged 5K, Allytics, ankle surgery, Bicycling, Cascade Bicycle Club, left ankle, Redmond Derby Dash, Rock 'n Roll Seattle Marathon, Sammamish River Trail, Seattle Marathon, Walking. Bookmark the permalink.